Thanks! 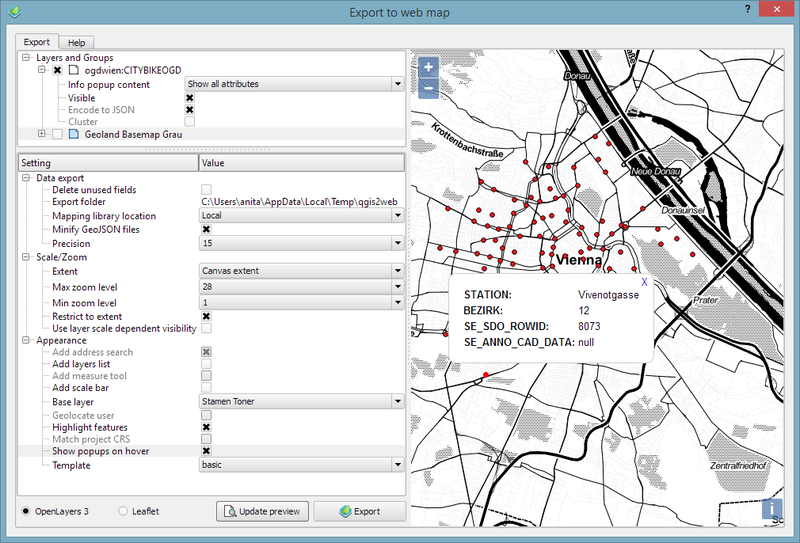 Do you mean that you’d be interested in integrating LIzmap export into qgis2web? Sorry I misspoke. I mean, Lizmap can be added to the list of quick webmaps tools. Do you have Windows-specific instructions for the necessary installation steps? 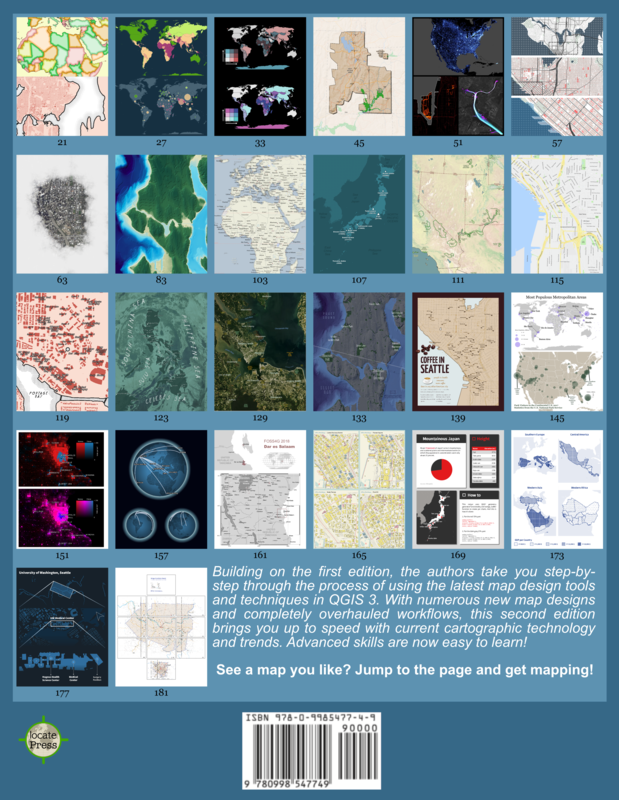 Quite a few users would be very thankful for a QGIS web stack with Win support & docs. QGISCloud is similar but different :) There, the user publishes to a QGIS Server instance which is hosted by Sourcepole. The other plugins I presented in this series create stand-alone web maps which can be hosted on any web server. But of course it’s a very similar theme. Any help would be tremendous! Thanks very much. You don’t need to install anything. For support, it’s better if you get in touch with the developer on the plugin Github page. Sorry it’s not been working as well as it should. If you can upload your source data somewhere for me to test, and tell me your settings, I can take a look at it. It’s the source layer I need. Can you upload that? Is there any place I can connect with you outside of this forum Tom? Thanks. You can get me at https://github.com/tomchadwin. I’d I can see your data, we can take it from there. Hi Tom, Could you check the zip in the same directory? I put the .prjs (because the datasets are huge) and the project page. I also put the fixes for the maindialog and utils pages but, the utils page code didn’t match with the version I have and the fix in Github. Thanks! 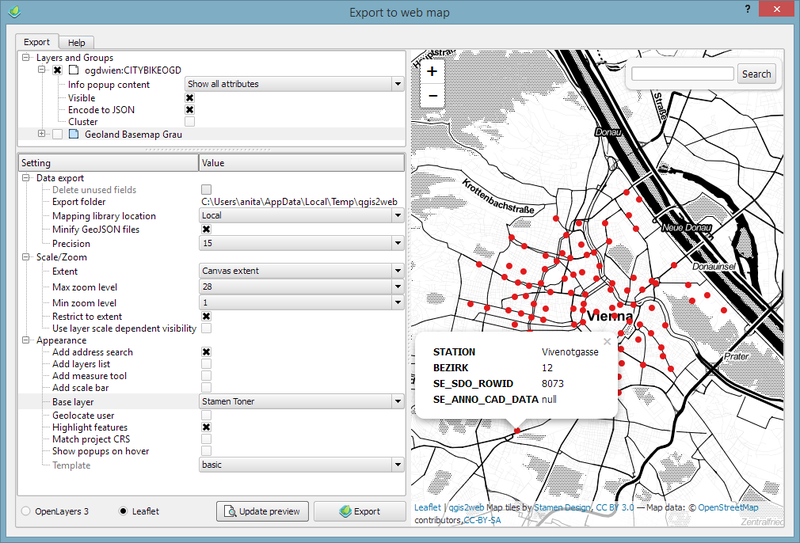 Which version of qgis2web do you have installed? The fix I linked to is from a good while back. If you are using the latest release, you’ll have that fix already. When I’m at my desk tomorrow, I’ll figure out a console command for you to type which will help us figure out what geometry type the layer is. As I say, that seems to be causing some of the problem. I found the CRS and changed for the three layers (to: NAD_1983_StatePlane_California_VI_FIPS_0406_Feet) and made that the setting for the one data layer that reflects polygons in my CSV. The problem seems to be that the plugin is trying to render a layer with no geometry (WKBType 100 from your first error). Layers with no geometry should not make it into the plugin layer list, so I’m not sure how that is happening. Are you able to narrow down the issue to a single layer which causes the problem? If so, and you can send me that layer, it will help in diagnosing the issue. Also, I think I have simply confused matters by linking to the former commit for a similar issue. I wasn’t asking you to change the plugin code at all, and suspect that the changes you’ve now made might not have helped. Can you reinstall either from the QGIS plugins repo or from Github? We can then confirm what the issue is. Hey Tom I reinstalled the plugin and have tried pinpointing this issue. The OSM seems to work better. It triggers a few alerts about broken scripts but, gives a workable map. The only big issue there is the Null value is appearing on the first two (projectsandstatus and projectsandstatusnumbers) layers in a large quantity. Is there a way to prevent display of Null values? For the Leaflet map, which I would prefer so I can use and tweak it more I’m getting this message below. I uploaded both in the same directory (and put the others in the archive). Thanks for any help you can give. I’m getting the following error message and QGIS crashes soon after I run the qgis2web plugin. Any help please? Please use the plugin bug tracker for support. Did you ever solve these issues Tom? I’m having very similar problems. No preview, error messages if attempting a leaflet, I downloaded the plugin zip, If I attempt to export it anyway, it launches Internet Explorer (not my default browser) and Google Search Engine. Can’t find advice on QGIS pages! Thanks Anita! 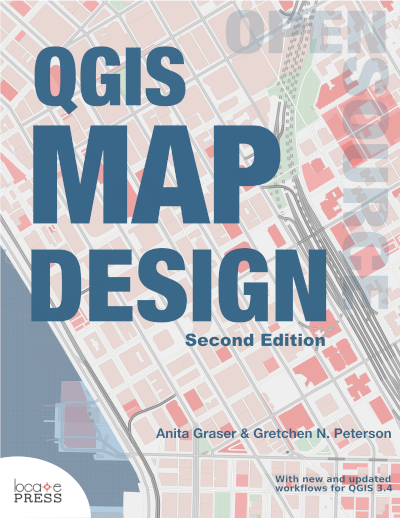 This, coupled with QGIS server’s WMS functionality, enables a web mapping server for dummies like me. One more thing… If you use datasets directly in qgis2web, it’s basically saved as geojson and is quite slow when dataset is huge. So I load the data through WMS instead. However, in the wms mode, I could not click the features and see the attributes of the features. Would be great if that function can be implemented. Hello Tom. Have you put any restrictions your plugins use? I am looking at using it to display a few datasets (grass cutting initially) on my cash strapped local authorities website. I thought It would be a good idea to ask though before I do any further work with it though.